Look what cute package came into the mail this week. Love the lady bug stickers from Lauren Nicole Gifts. This is what was inside: A Victorian Wax Seal Necklace. Even cuter! Wax Seal necklaces are hand made to order just for you by casting wax seal stamps with sterling silver. Each piece is unique and has the look of an antique wax seal. The timeless designs go well with everything and can be worn for years to come. The wax seal necklace designs include wax seal initial necklaces, wax seal key necklaces, and wax seal pearl necklaces. 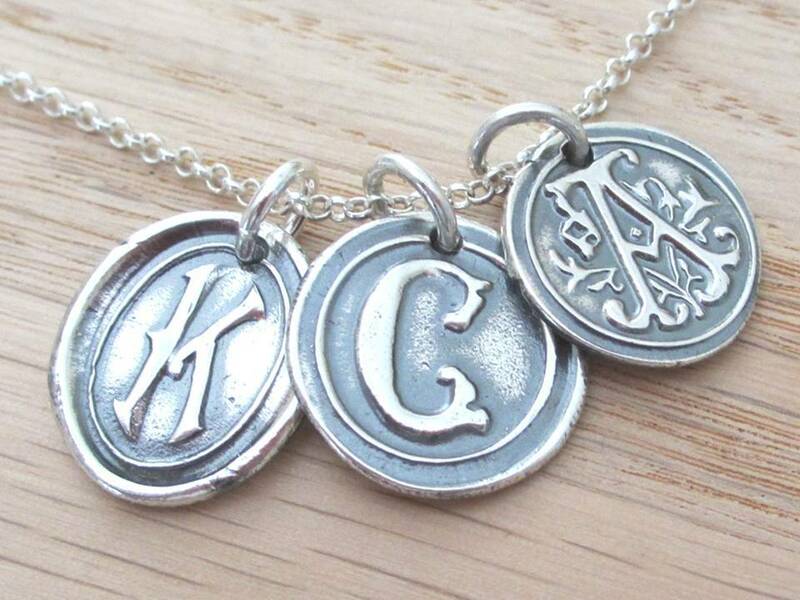 If you would like to design and build your own necklace they sell most of our hand stamped name charms individually in our CHARMS and CHAINS sections. Aren’t these just beautiful and I love the addition of the pearl on my necklace. 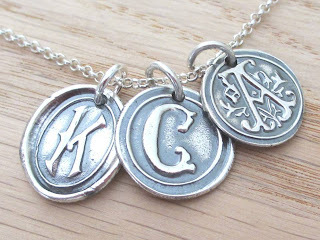 What great additions these would make to a charm bracelet for your kids or grand kids initials. She also has some great non-initial designs too. The holidays are right around the corner make sure you bookmark this webpage so you don’t forget. The necklaces start at $80–mind you they are sterling silver and totally hand crafted. What new mommy or grandmother would not love this charm or necklace? Check out Lauren Nicole Gifts on Facebook and the website and see the beautiful and unique jewelry items as well as the great prize you can win!! See you back on Friday for this giveaway valued at $80. how cool > these are super great for all kinds of occasions!! Wow those are beautiful and a perfect gift for my mom who can only wear sterling silver or nickel free jewelery. Very cool. I have not heard about using wax seals before but it looks lovely. Thanks for sharing. I like how unique they are, very pretty. These are so pretty and unique – would make an awesome Christmas present! I will definitely stop back by on Friday! I love the necklaces. Necklaces and earrings are the only jewelry I wear, so I try to make sure they’re fun and unique. I think these fit the bill! This is beautiful! I want one now!